(Community Matters) I’m not on flight path of helicopters so we’re not experiencing, nor are we even participating in F1 this year. I bet we can improve the paths and systems to minimize disruptions next year. I live near UT’s football stadium – car packed streets, exhuberant (not always sober) fans, loud bands, and an announcer’s booming voice reverberating even inside my house are just part of football weekends – part of what makes Austin weird & loveable. Wondering if one weekend a year helicopters overhead might be just as funky. 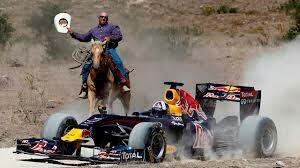 I’m flabbergasted by those Austiniites begrudging F1 even being held here. We host SXSW, ACL, Fusebox, RaggaeFest, Republic of Texas Biker Rally, Texas Relays – what’s wrong w/ hosting another world class event that appeals to a significant (if other) segment of Austinites? Feels like reverse snobbery. As for the broad slight of 1%’s, I know it’s just tongue-in-cheek (Jason Sabo’s a friend) but it’s a jab at a group which includes many folks who fund good work and who supported the man just reelected as president, have funded many of Central Texas’ cultural amenities and who fund lots of our private health & human services. someone wrote a good comment on another posting: F1 is good for Austin and we need to be good hosts. But it’s fair for hosts to expect that our visitors be good guests, not disruptive ones. There are better sites for a helipad than a residential neighborhood. The sites being used were picked for the sake of the riders’ convenience–they’re close to downtown hotels. With a little effort and planning, the City could’ve located sites less intrusive on folks’ homes.